It's Going To Be A Fun Weekend! I was on my way home from work. My usual route is the fastest means of transportation - the Metro Rail Transit. I thought it's going to be an ordinary routine going home but it turned out to be different. I was just waiting for the train to reach the Taft station, the last station where I'm supposed to hop out of the train. Just when I recognized a woman who seem to be not in good shape right across where I was standing. I came to her just in time when she fainted. Thankfully, some of the women in the train helped me carry her out. We laid her on a bench and massaged her hand and back and tried to wake her up. It was amazing how these strangers were willing to help out. I don't wanna leave the girl alone with the other women because you just can't trust anybody here in Manila. So I waited for her to feel better before I left her in the hands of the security guards on duty. As soon as she's awake and able to walk, I bid goodbye. She thanked me before I finally turned my back and left the train station. I still wonder what was wrong with her. Why she fainted. She must not have eaten breakfast this morning. Or it could be something else. I really don't know. I'm just glad I'm able to help her. You too is a good samaritan. I appreciate what you did as well as the other girls. God sees what you are doing. You have such a huge heart and good soul! May God bless you more! You sure deserve a pat on the back as not many people will be willing to be inconvenienced by the needs of others. Thank God for angels on earth like you Allena. And yes, you deserve a pat on the back and not just a pat but a whole accolade for lending a helping hand. You'll never know what could have happened to her if you weren't there. Bless you. you indeed deserve a pat on the back, for helping someone who needed your help at that time. hope she is okay now, and you did the right thing, waited for the authorities to help her out. kudos to you. You are indeed a good Samaritan Ally. That girl is so blessed to be near you that time. I think you are a heaven sent to her. In a place like Manila, it is very seldom to find good samaritan nowadays. Way to go girl! That woman must be thankful for what you did. Indeed, someone like you deserves a pat on the back. You are a good Metro Manilan..LOL joke lang po. 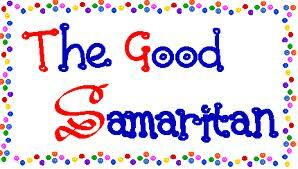 But indeed, you are good Samaritan not only today but it the days to come. Mark it!